The issue of multiple First Vision accounts has tripped up the faith of some LDS in recent times. The LDS church uses the 1838 account of Joseph Smith’s First Vision to teach members and future investigators of how God selected Joseph to restore his true church, focusing on the message of LDS exclusivity. As is the nature of true history, historical analysis muddies the waters quite a bit. Enough that the awareness of Joseph’s multiple accounts of the vision and the apparent inconsistencies, has been a stumbling block in the faith of many LDS recently. The church is making good steps forward to take responsibility of its past oversimplification of church history and to present a more accurate history. As former LDS spokesman Michael Otterson recently acknowledged this is not an easy endeavor. Like many institutions, from business to government to religion to law enforcement to media and a host of other areas, the Church has not found the transition to greater transparency a particularly easy one. Reconcile the multiple accounts looking for commonalities but largely ignoring inconsistencies. Raise a little doubt about how certain God’s pronouncements in the 1838 account were, ie acknowledging that Joseph went in with some preconceived notions that were “confirmed” by God, possibly raising doubt that it was God’s actual words we read in that account canonized in the Pearl of Great Price. Point out that humans naturally tend to emphasize different aspects of a story when retelling the event over time, which might actually confirm the truthfulness that Joseph was not lying about having an experience with God, because if he were lying he might tend to stick with one story and retell it the same exact way every time. With the LDS topics essays, there have breakthroughs such as new views of Book of Abraham translations and openness on Joseph Smith polygamy and use of seerstones. We’re seeing Church History 2.0. This version is progress, but it’s most likely one of many step forwards and revisions until the we can make sense of everything. I have never focused much of my attention in all my writings to the First Vision. When I went through faith crisis, the multiple First Vision accounts issue was not one of the top issues for me. I believe something happened to Joseph. I had seen a vision; I knew it, and I knew that God knew it. 1. The act of seeing external objects; actual sight. 2. The faculty of seeing; sight. vision is far more perfect and acute in some animals than in man. 3. Something imagined to be seen, though not real; a phantom; a specter. 4. In Scripture, a revelation from God; an appearance or exhibition of something supernaturally presented to the minds of the prophets, by which they were informed of future events. Such were the visions of Isaiah, of Amos, of Ezekiel, etc. 5. Something imaginary; the production of fancy. 6. Any thing which is the object of sight. I believe this gives insight into what was happening with Joseph Smith in the sacred grove. My own personal belief of what happened. I think there are logical reasons to believe many different things about the First Vision, but this is my personal view. 1) It was a visionary experience presented in his mind and likely not an actual, physical experience. 2) It was likely a collaborative experience, one where an external spiritual element was involved, but also a participatory element, such that Joseph may not have perfectly understood what was external and what was created. This explains to some degree why there are inconsistencies in the accounts. And also why those inconsistencies correlate with Joseph’s expanding understanding of the nature of God and his role as a prophet. 3) The vision was real and powerful, and did exactly what we as missionaries taught it was. It was the call for Joseph to serve as prophet. 4) It was very personal. The experience was personal. The message was personal. Though Joseph used it in the canonized 1838 account to speak to the world on behalf of God, for at least 10-15 years after it happened, I don’t believe this is how Joseph initially understood its purpose. I believe he thought it to be only for Joseph’s personal understanding. 5) It might have happened anytime in Joseph’s teenage years. The identification of it as 1820 might be a little early. 6) James 1:5 and the desire to know the truth about God and religion was likely a motivating factor. But also, like we all can imagine an experience with Deity to be, thoughts of personal worthiness and repentance were also an important element of the vision. 7) Satan and the doctrine about Satan is best understood metaphorically not as an actual entity, but the emotions of doubt and fear and personal unworthiness that we talk about Satan using against us were likely experienced by Joseph deeply as the vision started. 8) Joseph likely experienced the interaction with God in the Trinitarian Christian tradition of one God being manifest in God the Eternal Father and His Son Jesus Christ, similar to Stephen the Martyr’s vision. 9) It happened in the spring in a grove of trees near his house. 10) The vision impacted Joseph deeply motivated him to change and sustained him throughout his life. Compare the before and after. The title appalled the Palmyrans who thought of Joseph as a poor, rural visionary with pretensions to “see” with a stone. After making inquiries in Palmyra in 1831, the New York reporter James Gordon Bennett concluded that Joseph was “a careless, idle, indolent fellow.” When questioned, neighbors described the Smiths as “lazy, intemperate and worthless,” given to money-digging and lying. One onlooker later recalled Joseph’s occasional attendance at revival meetings, but most denied that he had any religious character. He appeared to be an easygoing boy with little ambition. No imagined him as a prophet. We use the First Vision to support our view of the Godhead separate, physical beings. It is clear Joseph’s theology changed. He seemed to be a Trinitarian at the beginning and when the Book of Mormon was produced. By the Nauvoo period, he definitely had a different understanding of God. Did that come out of the First Vision or from other understanding and revelation? I think it must be the latter. To me, there is nothing about the First Vision that would infer any different understanding of the nature of God, including physical body vs spiritual or Trinity vs LDS Godhead. 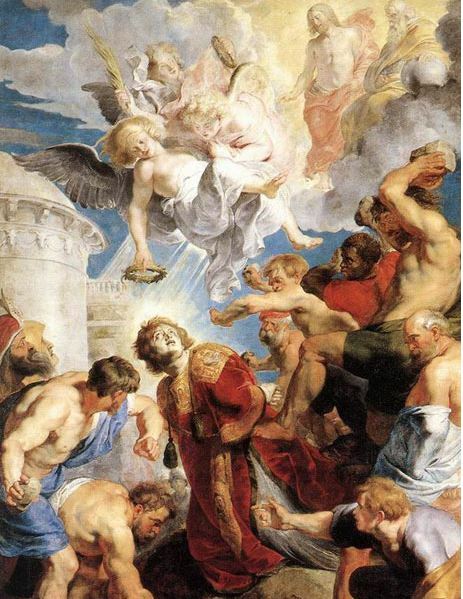 This is the painting “The Martyrdom of St. Stephen by Dutch painter Peter Paul Rubens in the early 1600’s. This shows how Trinitarians would imagine a vision of God. This looks very like the amalgamation of the four main accounts: concourse of angels with Jesus Christ as the focus but also God the Father present. I think we’ve had the purposing of the First Vision wrong. We use it to prove exclusivity. The inclination to use it for exclusivity comes naturally from the specificity of the 1838 account. But this specificity belies itself on examination. God tells Joseph no other churches teach his doctrine and they are an abomination, yet just a few years later God reveals the text of the Book of Mormon to Joseph, which wasn’t perceived as being doctrinally any different than churches of Joseph’s time. Do I think God spoke these words to Joseph Smith? No. Do I think that makes him a fraud or that it means the First Vision didn’t happen or that I reject the Pearl of Great Price? No, No, No. I’ve talked about the idea of New Mormonism. I also like to call it “Less Certain Mormonism.” The specificity we use gets us into a lot of trouble. But we don’t need to downgrade Joseph’s First Vision into something insignificant. We don’t need to dump the 1838 account from the canon. Richard Bushman gives us useful tools to analyze scripture, when he says we need to look at who wrote scripture and the context and culture and try to understand their situation and why they would use those words to describe God. I like the church’s progress on this. Step 1 is to acknowledge the historical information. That’s done. Step 2 might be to modify the logic and repurpose the meaning of the First Vision for us as a church. What can the First Vision mean to us as a church? Greg Prince said: “Joseph saw the face of God. And he created a set of symbols to allow his followers to do the same.” I think it’s about that simple. I thought about this as I took a walk this morning. Like the morning Joseph entered the sacred grove, it was a lovely spring morning. Sweet birds were singing. I pondered the same things that were in Joseph’s mind. What is truth? Is God aware of me? What path should I take? Sunlight peaked over the mountains, a symbol humans from the beginning of time has seen as God’s interaction with man. I felt Him alive. I felt a glimpse of how he felt about me. I felt answers to my prayers. This is the repurposing of the First Vision in the LDS church in the post-internet age. God is alive in the world today. God is no longer stuffed shut in the pages of the Bible. He’s on every continent in every time. He inserted a bit of wisdom into Joseph Smith that led him to take on the calling of a prophet. How about that for a start? Let’s dial back the specificity but retain the important message of the First Vision.